Used by the body to manufacture and for the growth of cells including red blood cells, for energy production, helps to prevent depression, treats anemia, helps to prevent birth defects and premature birth of children.) It is also known as vitamin B9. Repeated studies have shown that women who receive a sufficient amount daily, before conception and in early pregnancy, have a decreased risk of having a child with a severe neural defect (a congenital defect that involves incomplete development of the brain and spinal cord). The most common neural tube defects are spina bifida (an incomplete closure of the spinal cord and spinal column), anencephaly (severe underdevelopment of the brain) and encephalocele (when brain tissue protrudes out through an abnormal opening of the skull). All these defects occur during the first 28 days of pregnancy, often before a woman to realize that she is pregnant. 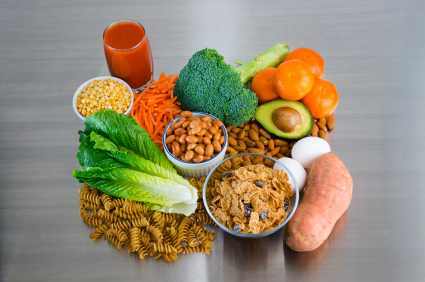 Folic acid is present in many foods: liver, milk, cheese products, green vegetables (asparagus, spinach, kale, carrots), wheat germ, lentils, whole grains, dates, bran, brewers yeast, whole wheat, barley, brown rice, oranges, leafy green vegetables, root vegetables and mushrooms. Daily needs is very high: 100 to 600 micrograms, depending on age and physiological state of the person. However, a diversified diet gives sufficient amounts of folic acid. You should eat vegetables with folic acid as many as possible. Anemia, inflammation of the tongue, gastrointestinal / digestive problems, memory problems, birth defects in children, fatigue and labored breathing. Alcohol abuse decreases the absorption of folic acid. Corticosteroids, methyldopa (anti-hypertensive), some sulfonamide drugs, pyrimethamine (anti-malaria), trimethoprim (antibacterial) and methotrexate (chemotherapy) decreases the effect of folic acid. Some anticonvulsants decrease the effect of folic acid and folic acid alters the response to the anticonvulsants. Oral contraceptives increase the need for folic acid. Consult your nutritionally oriented doctor before supplementing with folic acid if you have had pernicious anemia, or have liver disease. It is not recommended to take prolonged courses if you have a hormone-related cancer or convulsive disorder. Folic acid is best combined with vitamin C and vitamin B12.